Notes: I could be wrong about the chicken, it could be something else. Also, is dining on ceramic plates typical in Lithuania? i'm from lithuania and what can i say? well yeah, in my school the dining was on ceramic plates. There are always ceramic plates in Lithuania. And this is ony one part of usual Lithuanian lunch at school. Kids always get soup. I can't remember a day without soup at school, and both my kids have it too. Looks more like turnip then potato. In Latvia, which is next to Lithuania, it is typical to eat from ceramic plates too, at least in all schools i've been. 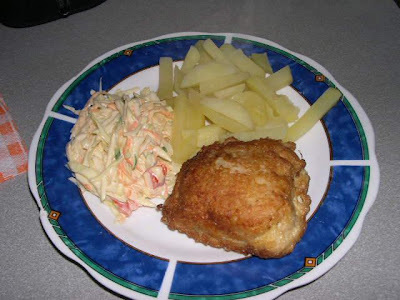 I am from Latvia and I remember i wasn't a big fan of school lunch, but there were days i liked it. Also in high school i became vegetarian, it was difficult to eat at school because we did not had any choices, the only choice was to eat for example that days gravy or eat just plain potatoes, there was no options and we needed to pay for the things we did not eat anyway, but thats okay because the cost was not so bad and i always gave my "meat part" of lunch to my classmates and anyway it was healthier to eat warm school lunch than eat in our school cafe. In school cafeteria there was just sweets and buns and small portions of packed salads, but they all were with meat or fish,so it was hard to be for example vegetarian or someone who had some allergies or something, but yeah i survived:) i wish i could send some photo with school lunch here in Latvia, but i graduated and have no photos of my school lunch taken.